Quick connectors are devices that are used to join two or more pipes, hoses or tubes together in order to prevent leaking or a drop in pressure. This is a general term that refers mainly to quick couplings and quick fittings, but it is used to refer to several other connector varieties as well. Different industries use varying terms to identify connectors, couplings and fittings, so there are many similarities and overlapping areas. In the broadest definition, quick connectors are understood to be devices that attach to pipes, hoses or tubes immediately and easily. They can also be removed rapidly and are also called quick disconnects. These parts can be assembled and installed without the use of tools and are made of stainless steel, brass, aluminum, titanium or plastic. Some quick connectors are plugs while others are threaded or have rotating threaded sleeves. Other connectors snap onto the outside of the pipes, hoses or tubes to avoid inhibiting the flow. 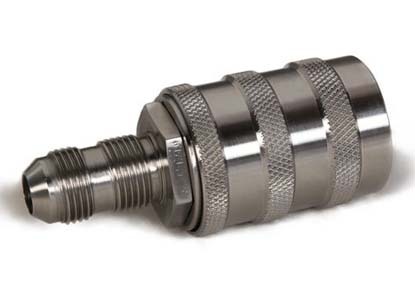 Because of the extensive use of quick couplings, fittings and fasteners, quick connectors are found in a wide variety of applications and industries because they are fast, easy and useful. 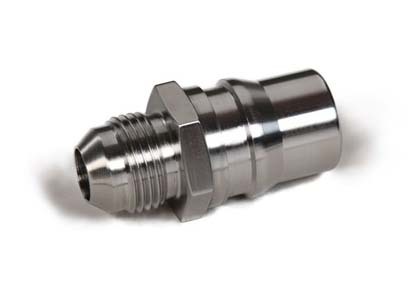 Quick connect couplings are used in fuel transfer, automotive systems, chemical processes and more, while quick connect fittings are helpful in agriculture, plumbing and manufacturing, among other industries. Quick connect fasteners are used in repairs made in space, for example. Quick connectors can have a very simple design and function, or they can be more complex. A plug fitting is a small, open cylinder that wedges tightly in the ends of two pipes, hoses or tubes and allows fluid to pass through. For a tighter connection with less leakage, a fitting might have multiple O-rings, a cap, collet and body in an assembly where a pipe slides into the opening of the fitting and is held in place by a watertight seal. Quick connect fasteners are different in appearance but similar to regular nuts, bolts and screws in terms of strength and longevity. They are used to reinforce damaged structures or vessels and in environments where a maximum amount of work needs to be done in a short amount of time. Quick connect fasteners have simple installation but are securely attached and can only be removed by unscrewing them in the same manner as conventional nuts, bolts and screws. Quick connect couplings are mechanical devices that use seals and valves to permit easy and immediate connection or removal of air and fluid lines. Depending on the required seal and performance, couplings range from single-poppet valves to automatic mechanisms that breakaway if excessive force is applied.